After logging into your WordPress website admin area, the first admin screen you will see is the WordPress Dashboard screen, also known as the admin home page. The WordPress Dashboard is where you can view WordPress updates and manage all the features of your site. The Dashboard tells you about recent activity both at your site and in the WordPress community at large and provides access to updating WordPress, plugins, and themes. 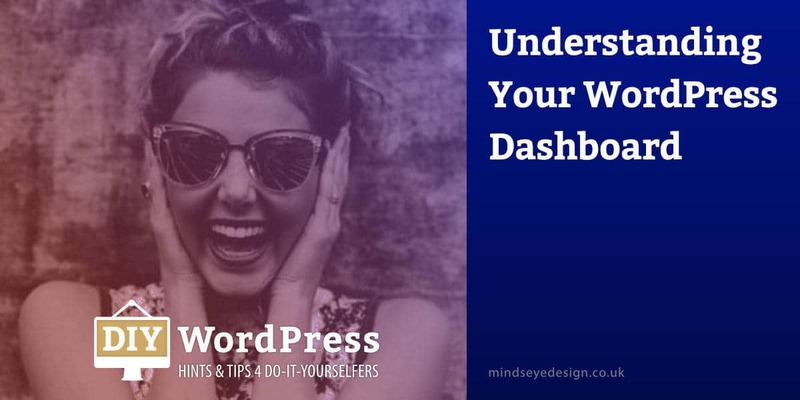 It may seem a little confusing at first glance, but once you’ve found your way around your WordPress Dashboard, managing your site will become second nature. Take a few minutes to click around and explore. On the left side of the admin area screen, you’ll see a vertical menu. This menu provides you with a comprehensive list of tools that allow you to perform certain functions on your WordPress site. Each tool has a menu tab in the Sidebar, and hovering over or clicking on a menu tab will usually expand or open a further submenu. Posts – Here you can view, add, edit, or delete blog posts on your site. Media – Allows you to view, edit and add to your media library of images, audio or video content. Pages – View, add, edit, or delete your website’s pages. Appearance – List, add and update your website’s theme, framework or template. Plugins – List, edit, add and update your website’s plugins. Users – Edit website admin user profiles. Tools – Includes system tools for performing non-routine management tasks. Settings – For configuring settings for different sections of your WordPress website. Tip: To save space on your screen, you can collapse the Sidebar by clicking on the Collapse Menu link, which appears as the last link on the Sidebar. Click the Collapse Menu link again to expand it. Along the top of your WordPress Dashboard admin area, you’ll find the Admin Bar. WordPress logo – Provides links to WordPress and various support items. Website name – In the top left corner of your Dashboard, you’ll see the name of your website. This is a link to view your website as others see it on the web. Speech Bubble – Next to your website name is a speech bubble icon, which is a quick link to your Comments page. + New – Hovering over this icon reveals a drop-down menu where you can quickly add new posts, media or pages. Your Nickname – In the top right corner of your Dashboard you will see your Nickname. Hover over this to reveal a drop-down menu where you can access your User Profile or log out. Screen Options – Below your Nickname, the Screen Options tab allows you to show which modules you’d like to see on your WordPress Dashboard, such as ‘Activity’ or ‘WordPress Events and News’. Help – Also below your name is the Help tab, with links to documentation and advice about the screen you are on. We’ll talk more about the Admin Bar in another ‘WordPress Help’ post, but hopefully, you’ll now be a more familiar with the features of the Dashboard and ready to delve a little deeper. Tip: To change your WordPress admin area password to one you can remember, hover your cursor over the Users tab in the left-hand menu, (the Sidebar) and click on the ‘Your Profile’ link. You can change your admin area password there.